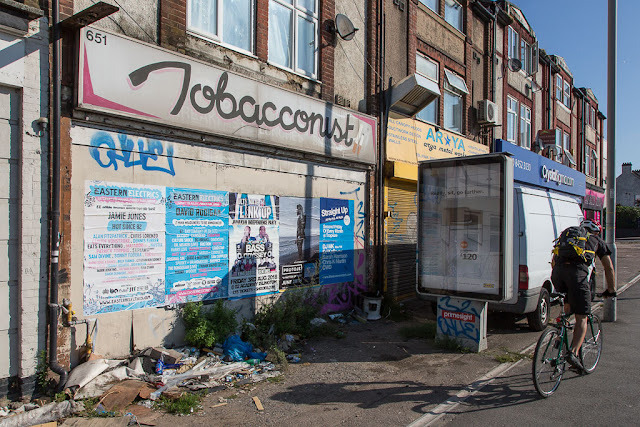 Yesterday morning I took Olga on a long walk up to Brent Cross, an area north of us where there's a big shopping center. We didn't need to go shopping, but I wanted to shoot some photos in the area. It's a fairly gritty urban environment, at least along the main roads -- you know I like that kind of thing. 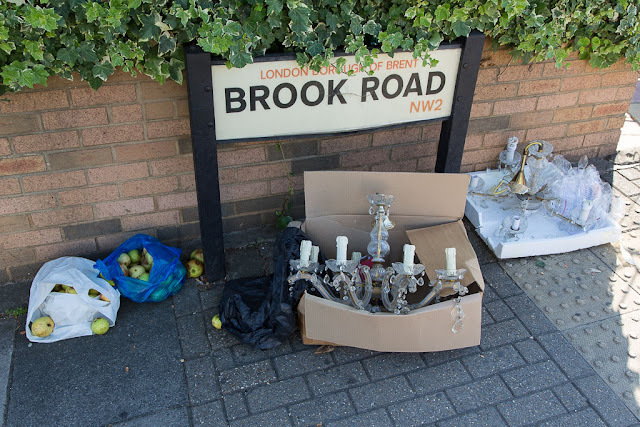 Among the curious finds of the day -- two chandeliers and two bags of apples, all discarded on the same corner. Olga was very patient during this urban exploration, trudging pantingly beside me and waiting while I took my photos. As a reward I took her to Gladstone Park, where we've been a few times before. This was clearly the best part of the day, as far as she was concerned. Love that high summer grass! Oh, remember our continuing mouse-control saga, and how each time we catch a mouse in a trap, I put the tiny carcass out in the back garden for the critters to take? Well, that system has worked well. The mice always disappear overnight. I've been curious about what's taking them -- a fox? A neighborhood cat? ... and now we have an answer! Definitely NOT a cat, at least not in this case. This morning, I'm off to Florida! I'm planning to leave momentarily for Heathrow and my flight to Miami and then Jacksonville. Coming to you next from the Sunshine State! Have a lovely time in Florida Steve and give your mum a big bear hug from me! Please be wary when conversing with Trumpites - you could get hurt! 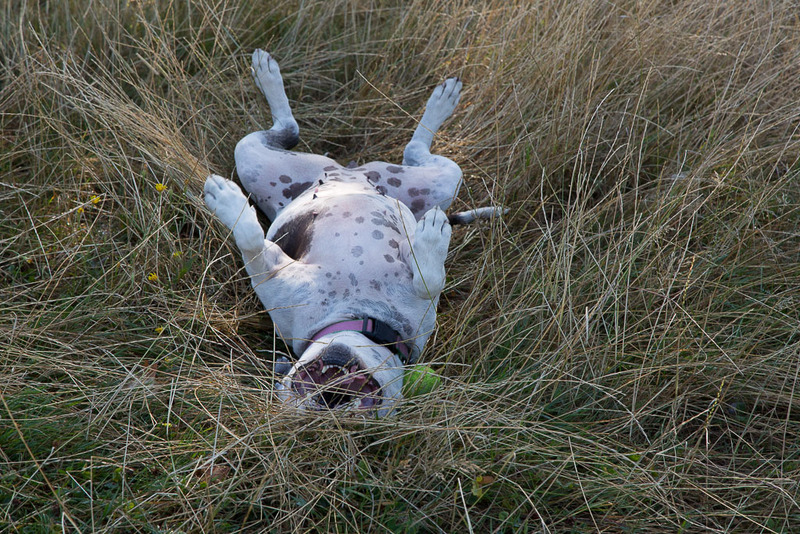 Just love the photo of Olga on her back, reminds me of a frog for some reason, must be the back legs. 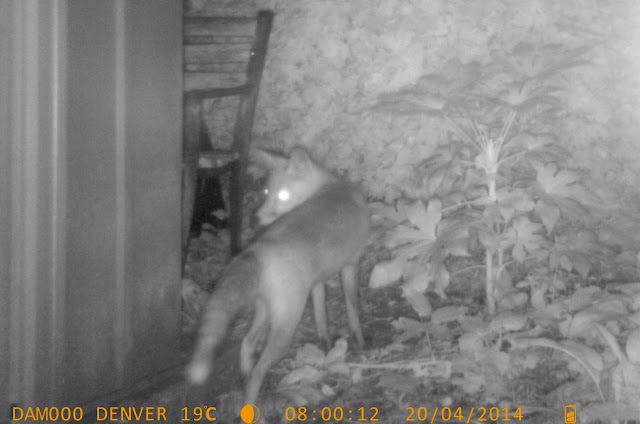 Lovely night shot of the fox, he looks in good shape. ENjoy your reunion with Mum and come safely back. You know how to find us. Japanica awaits! You didn't grab a chandelier? I think I would have. I'm with Ms Moon. I'd have definitely grabbed one if not both those chandeliers. safe journey! You use a very tactful term"gritty neighborhood" for this area. Interesting neighborhood. Love that photo of Olga. She does look so happy. Have a safe and wonderful journey. Looking forward to your posts from the sunshine state. I'm sure you are half way there by the time I read this but, "safe travels" anyway! You'll need that sunblock where you are going. Love that photo of Olga! Yes, Olga looks very pleased with herself. And that fox looks properly wary. Maybe if you could encourage him to linger in your yard he'd get the mice before they can get into your house! Have fun in Florida, but prepare yourself for the heat! I love the photo of Olga rolling in the grass. She's so cute. that photo of Olga looks like she's smiling lol,, cool night cam shots,, all was revealed!! Happy journey! Who wants to be a chandelier?